The Texture group lets you select a layer to be the custom particle texture. It also sets the particle texture's behavior, for instance, which frame of the layer to sample from. The particles that use particle textures are the Sprite and Textured Polygon options in the Particle Type popup. All layers or pre-composed layers are valid inputs. You can use a bitmap image, shape layer, movie or pre-comp. If you are using a text layer, that layer must be pre-comped. This chooses the source layer that will be used as a 'texture' or custom particle. All other Texture group parameters affect the image loaded into Layer. By default, the Layer popup is set to None and turned off. To turn it on, just choose a layer from the popup box. This layer has to be in your Timeline, and the View (eye icon) should be turned off for that layer. Note that small layers (20-100 pixels) should be used for Layer emitters. Using larger layers will drastically increase render times and may result in instability depending on particle counts and system resources. Time Sampling determines which frame of the layer is sampled to generate the custom particle. There are 11 modes. The mode determines which frame the custom particle is sampled from with options for starting from the first frame, picking a random frame, or splitting the layer source into multiple clips. When using an animated particle, the other modes are useful. The Start, Random and Split modes can drastically reduce the time needed to pre-render the custom particle layer. The Start at modes all begin at frame one (the start) of the custom input layer. Split Clip modes split the custom layer into a number of clips. The number is set within the parameter Number of Clips. For example, if the custom layer is 30 frames, and Number of Clips is set to 3, that means the custom layer will be split into three 10 frame clips. This is useful for creating a set of animated particles. For example, you may have 5 movies that are 10 frames each in a pre-comp. 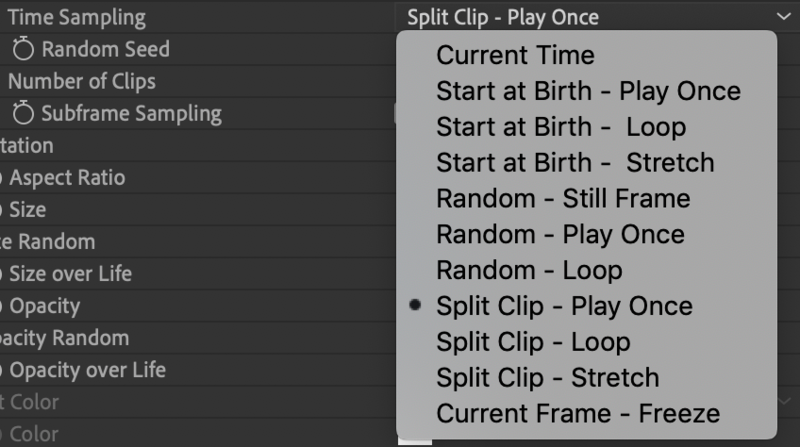 You may then select a Split Clip mode and set Number of Clips to 5, which will tell Particular to use just one of the 5 clips as the custom particle. Active when any of the Play Once, Stretch or Still Frame modes are chosen in the Time Sampling popup. This allows subframe sampling for the custom particle layer. This is useless if the custom particle is a movie, but if it is an animation, the plug-in can retrieve frames that are in-between frames.